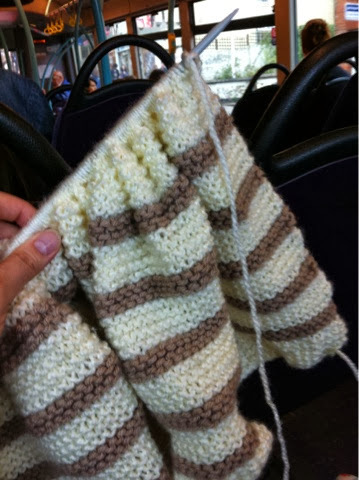 Mary Brodie - adventures of a busy knitter: Bus knitting! Making good progress on the latest baby blanket. The morning is damp and the bus smells like a wet dog. I am listening to an old episode of Brenda Dayne's podcast (Cast On). Looking forward to Frateing this weekend (not sure what this is but Aunty K is taking me so I can only assume it is fibre related) and Ally Pally next weekend (goes without saying! ).